Well folks it's the talented Hazel who has set the theme at MAWTT this week and she would like to see something Nice and Bright which has a recipe to it - Summer colours lovely and bright and add some flowers and ribbon too to wash away the autumn blues. I have been steering more towards the vintage and shabby in my designs and so I challenged myself to match that style with this challenge. I think it has worked, but of course it depends on how you look at it. 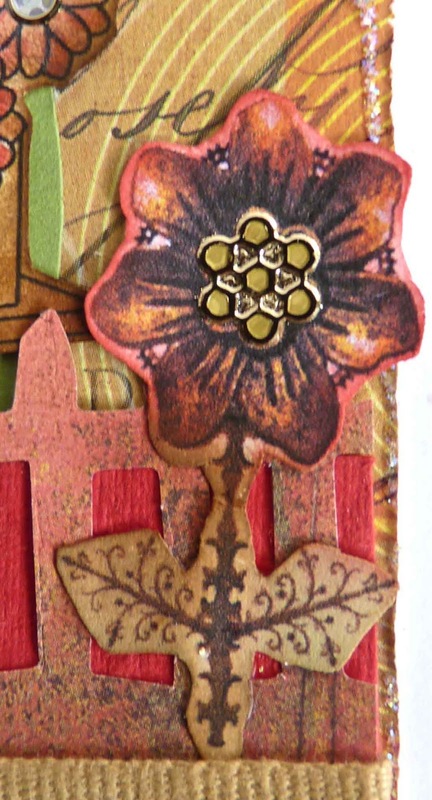 I wanted to have a go at the sketch on the Basic Grey challenge blog and although I have changed it slightly to suit my image and use of the picket fence die, it still follows the basic shapes and layout. My backing paper is from a Basic Grey DP stack. I have used red, yellow and green as the main colours which definitely gives the card a brightness, but then I've also toned down some areas by using vintage photo. 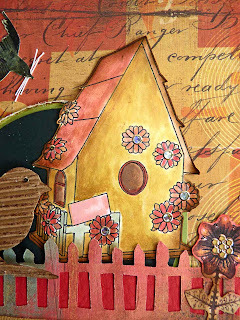 We were given some images to play with from the Stitchy Bear shop and I chose this one called 'Home Tweet Home' and created by Stitchy herself. I printed out the image and decided to paint it. Firstly I used DIs but wanted a more vintagy look so I went over it with a mix of DIs, Pearlidoodles and paint dabbers. Just what I wanted, the colours look older and there is a pearly shine to it. The butterfly and flower are from Dezinaworld and the bird in flight is by Ruby Robinson. The bird on the fence is a TH die. Can you see how the butterfly was created? I thinks it's fabulous - yes it's cogs and I just added some gem stickers to it. Please pop over and see June at Dezinaworld - she has the most amazing challenge at the moment and everyone - yes EVERYONE who enters will get a prize. Can't believe it? Click here. Hi brenda - sorry nit been in touch lately have been so busy .. i think everyone is at the moment . I love this latest card you've made Brenda. Such pretty colours and a gorgeous layout. Lovely scene, but gorgeous colours Brenda! So many little details too. Great job! Stunning! I love all the little details. Thanks for joining Inktegrity for our Hump Day Challenge. Love your card Brenda. Such lovely colours and so much detail. 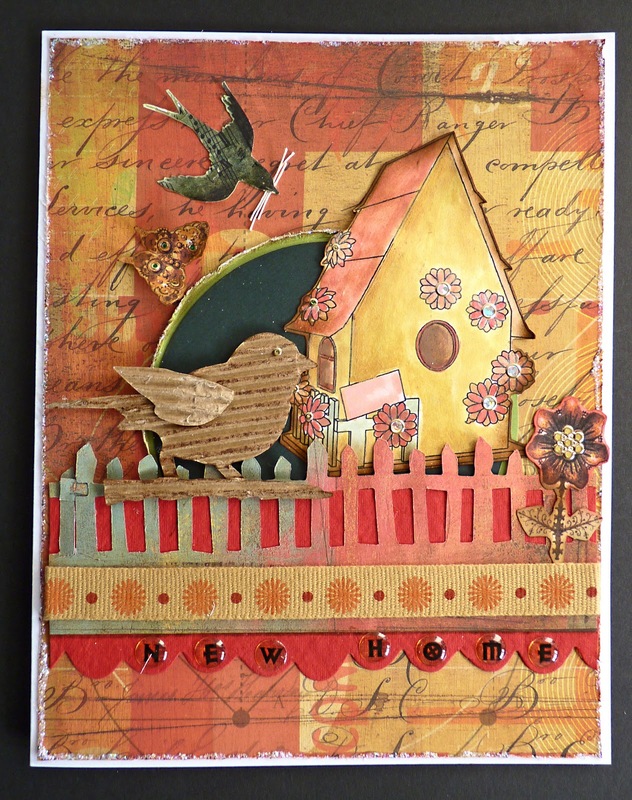 Gorgeous vintagey card, love the colours & LO love the birdie! Thank you for joining us at The Crazy this week, good luck & hope to see you back again soon! Gorgeous house. Love the colours. :) Thanks for joining us at Something Completely Different this week. Gez. Great house, lucky bird! Fantastic make.So glad you joined us at SCD. Wow - this is lovely and so many different elements. Just loving your work. Oh wow Brenda this looks wonderful, what gorgeous colours I absolutely adore the scene and images you have used I love it. Oh My goodness brenda, wow weee!! this is so so amazing I love it. 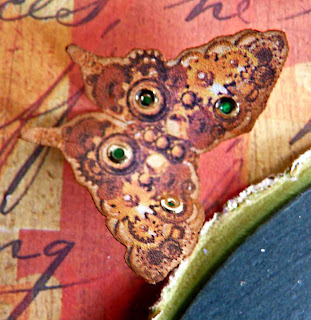 Wow gorgeous, that bird and butterfly are stunning, thanks for joining us at Lexi's Creations, we're happy to have you!